alaTest has collected and analyzed 14 reviews of John Lewis Nembus Semi-flush Ceiling Light, Chrome, 5 Arm. The average rating for this product is 4.5/5, compared to an average rating of 4.7/5 for other products in the same category for all reviews. We analyzed user and expert ratings, product age and more factors. Compared to other products in the same category the John Lewis Nembus Semi-flush Ceiling Light, Chrome, 5 Arm is awarded an overall alaScore™ of 85/100 = Very good quality. A great highlight to our living room. Quick and easy to put together and install. 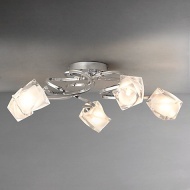 Stylish, can adjust each arm of the light so that you can highlight certain areas of the room. Good value for money. Like the "click and collect service"
Timely delivery and well packed. Unfortunately one light shade had a black mark embedded in the glass which I will be returning for replacement.